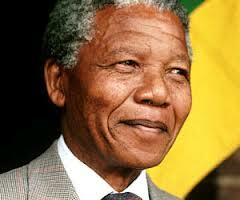 I remember the day Nelson Mandela was freed from jail after 27 years of imprisonment. It was on 11 February 1990. This being a national holiday in Cameroon, we were all at home, and could watch live as Nelson Mandela was released from prison and walked hand in hand with Winnie Mandela, both with their fists raised high up. Later that day, Mandela stood outside the balcony with his fist raised high up, and said: “Amandla!” to which the overjoyed crowd replied “Ngawethu!”, in other words, “Power to the People!” And he finished “iAfrika!” I am leaving you here with some words by Mandela himself. 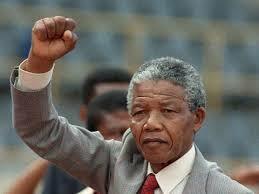 “I raised my right fist and there was a roar. I had not been able to do that for 27 years and it gave me a surge of strength and joy.” Describing the day of his release from prison in 1990 – Long Walk to Freedom, Nelson Mandela, 1994. “I am fundamentally an optimist. Whether that comes from nature or nurture, I cannot say. Part of being optimistic is keeping one’s head pointed toward the sun, one’s feet moving forward. There were many dark moments when my faith in humanity was sorely tested, but I would not and could not give myself up to despair. 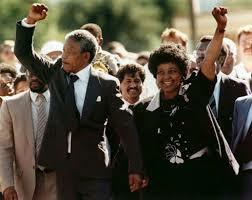 That way lays defeat and death.” Long Walk to Freedom, Nelson Mandela, 1994. “I learned that courage was not the absence of fear, but the triumph over it. The brave man is not he who does not feel afraid, but he who conquers that fear.” Long Walk to Freedom, Nelson Mandela, 1994. “Everyone can rise above their circumstances and achieve success if they are dedicated to and passionate about what they do.” Long Walk to Freedom, Nelson Mandela, 1994. “Education is the most powerful weapon which you can use to change the world.” Long Walk to Freedom, Nelson Mandela, 1994. “Resentment is like drinking poison and then hoping it will kill your enemies.” Long Walk to Freedom, Nelson Mandela, 1994. “I like friends who have independent minds because they tend to make you see problems from all angles.” Long Walk to Freedom, Nelson Mandela, 1994. “I found solitary confinement the most forbidding aspect of prison life. There is no end and no beginning; there is only one’s own mind, which can begin to play tricks. Was that a dream or did it really happen? One begins to question everything. Did I make the right decision, was my sacrifice worth it? … But the human body has an enormous capacity for adjusting to trying circumstances. I have found that one can bear the unbearable if one can keep one’s spirits strong even when one’s body is being tested. Strong convictions are the secret of surviving deprivation; your spirit can be full even when your stomach is empty.“ On Prison – Long Walk to Freedom, Nelson Mandela, 1994. “In the name of the law, I found myself treated as a criminal… not because of what I had done, but because of what I stood for, because of my conscience. No-one in his right senses would choose such a life, but there comes a time when a man is denied the right to live a normal life, when he can only live the life of an outlaw because the government has so decreed to use the law. … The question being asked up and down the country is this: Is it politically correct to continue preaching peace and non-violence when dealing with a government whose barbaric practices have brought so much suffering and misery to Africans? I cannot and will not give any undertaking at a time when I, and you, the people, are not free. Your freedom and mine cannot be separated. 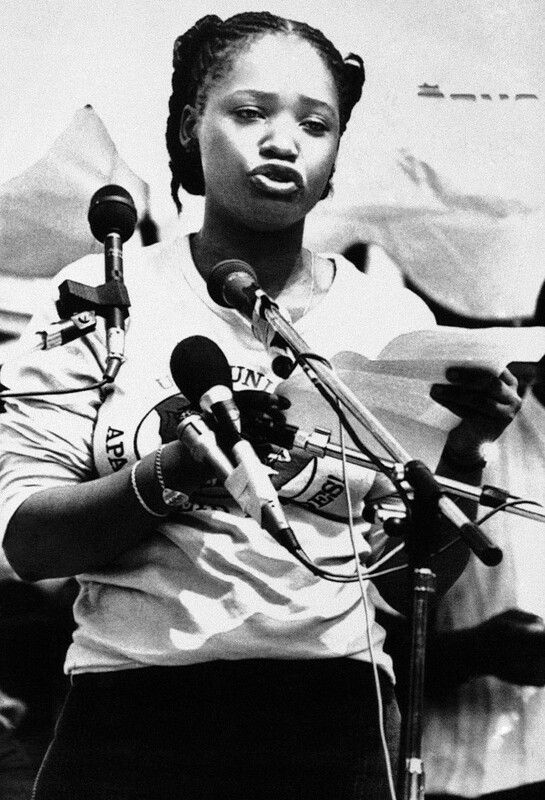 I will return.” Message read by his daughter, Zindzi Mandela, at a rally in Soweto in 1985. “It seems the destiny of freedom fighters to have unstable personal lives… to be the father of a nation is a great honour, but to be the father of a family is a greater joy. 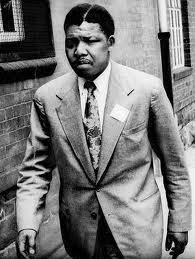 But it was a job I had far too little of.” Talking about fatherhood – Long Walk to Freedom, Nelson Mandela, 1994. “A man who takes away another man’s freedom is a prisoner of hatred, he is locked behind bars of prejudice and narrow-mindedness… The oppressed and the oppressor alike are robbed of their humanity.” On prison – Long Walk to Freedom, Nelson Mandela, 1994. “The value of our shared reward will and must be measured by the joyful peace which will triumph, because the common humanity that bonds both black and white into one human race will have said to each one of us that we shall all live like the children of paradise… But there are still some within our country who wrongly believe they can make a contribution to the cause of justice and peace by clinging to the shibboleths [dogmas] that have been proved to spell nothing but disaster. It remains our hope that these, too, will be blessed with sufficient reason to realize that history will not be denied and that the new society cannot be created by reproducing the repugnant past, however refined or enticingly repackaged.” On receiving the Nobel Peace Prize with F.W. de Klerk, 1993. “There is no passion to be found playing small – in settling for a life that is less than the one you are capable of living.” Presidential Inauguration, 10 May 1994. “Never, never, and never again shall it be that this beautiful land will again experience the oppression of one by another… The sun shall never set on so glorious a human achievement. Let freedom reign. God bless Africa!” Presidential inauguration, 10 May 1994. “There is no easy walk to freedom anywhere, and many of us will have to pass through the valley of the shadow of death again and again before we reach the mountaintop of our desires.” Long Walk to Freedom, Nelson Mandela, 1994. “I am confident that nobody … will accuse me of selfishness if I ask to spend time, while I am still in good health with my family, my friends, and also with myself.” On stepping down after his first term as president. 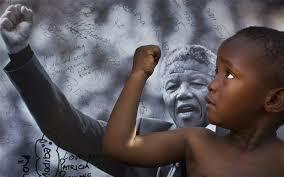 “Sometimes it falls upon a generation to be great. You be that great generation. Let your greatness blossom. Of course the task will not be easy. But not to do this would be a crime against humanity, against which I ask all humanity now to rise up.” Message at the Live 8 Concert in Edinburgh, July 2005.